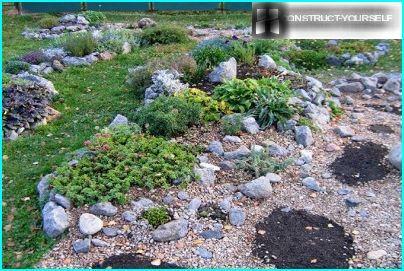 Rockery with your hands: the story of my rock garden with the "alpine"
IMPROVEMENT suburban area, I have been doingmore than one year. What I do not have, so it's potatoes, tomatoes and cucumbers endless. All my land - a garden with a lawn and ornamental plants, planted in flowerbeds, mixborders and other compositions. A special place here occupies rockeries, the creation of which began with a rocky beds, and ended the whole composition of stone, gravel and flowers. 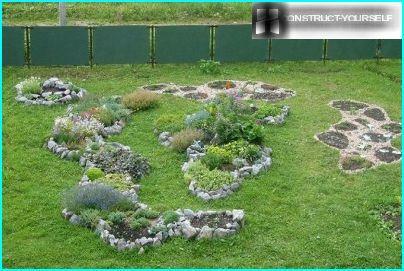 The idea of ​​creating rockeries was not accidental. 4 years ago, when I was just beginning to lay the first stones at him, about landscape design I did not have a clue. Rocky garden emerged as an inevitable component of my site. And that's why. The acquired land, which required the development, had completely infertile soil. A few years ago working on a bulldozer uprooted stumps and here, among other things, cut off all the fertile layer. Instead of the land we have, truckers, remained almost one clay, at which it was difficult to grow anything. And I would like to grow flowers! And I was not going to back away from their dreams. She asked her husband to bring me a few tires, pour into their land, brought from the forest plantations and abandoned greenhouses. Turned raised beds in which I have planted flowers. It grew well, in the first year, I just admired them and was happy. And next spring, looking at the work of his hands, I was disappointed. Tires still looking in my garden, as something alien. I wanted to be closer to nature. And then it hit me! Why not try to use stone instead of tires? Determined, I went to his booty to a nearby gully. I scored there suitable material is medium in size and began to creative work. 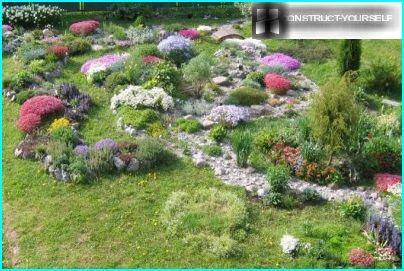 From the collected stone I posted first raisedflower bed, filled it with soil and planted flowers-alpine. Following was the second bed, next to her - the third. It looms composition which oppressed me one - monotony. Then my eyes fell on a pile of gravel, remaining after construction. And I decided that to be completely happy, I do not have gravel beds. I posted them as additional, related to the total composition segments. Then came the gravel creek flowing from the well to the flowerbeds. This stream was joined by a very useful service. It is thematically linked to the construction sites with Rocard, who had settled down, as it were separate from the rest. Rocky garden grew, and was rebuilt 4 years later acquired its final form. Basis rockeries - a stone that should bearranged in harmonious combination. It's complicated. We must strive to ensure that the composition has become kind of a rocky or mountainous terrain. And, of course, is important technology. 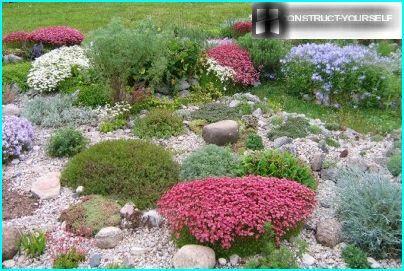 Without compliance with it, even stood in all design traditions rockeries risks through time to become your headache. For example, if it settles and forms a failure. 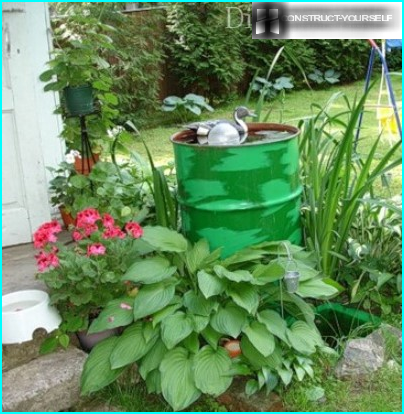 Or become a place of accumulation of rainwater and all the plants just vymoknut. Although there is often more. A stone powder weeds begin to germinate, which is very difficult to deal with in the already stacked stone compositions. Of all these troubles need to think ahead of time andbe proactive. According to the rules, the construction of rocky beds and slides, should be done in the fall. During the winter rocky mounds show all their shortcomings. Stones and ground prosyadut, covered with soil will be diluted with water. 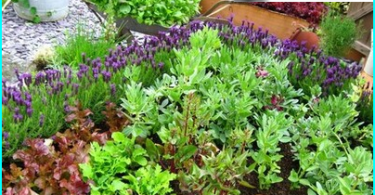 In the spring it will be possible to correct the deficiencies, to fill up where necessary to the soil or stones. And proceed to the greening. Such a step by step construction is especially true for the Alpine hills, flat beds not subject to shrinkage, so they can plant trees and gardens immediately, and all identified deficiencies corrected over time "in place." 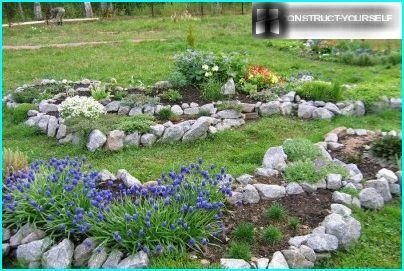 In a flower garden I used two main elements - the raised stone flower beds and gravel beds. The first were made of stone flowerbed. At first, I delineated the desired circuit, filmed inside the turf of about 20 cm. At the bottom was putting a layer of sand for drainage (10 cm), trample down its walls and lay stone beds. Then fell asleep flowerbed ground that, after planting, zamulchirovat gravel. Top has laid a few medium-sized stones for a variety of landscape painting. Technology for creating several gravel bedsis different. First, I took out the turf at 25 cm, covered a small layer of sand 10 cm, trample down. She would fall asleep on top of the gravel to the ground level, and trample down. The gravel dumping made holes, falling asleep to the soil, the plants are planted. According to the contours of the flower beds, to isolate them from the lawn grass, doing flanging of thick polyethylene film. On gravel laid on top of some rocks large and medium-sized randomly. Dumping gravel on the surface of the beds is notdecorative purposes only. This mulch is that, firstly, inhibits the drying of the soil. And secondly, does not clear up the weeds whose seeds are sometimes still puts in a flowerbed. Sometimes they germinate, but in much smaller numbers than in the non zamulchirovat, soil. Furthermore, through the gravel and easier to pull them. Where the soil remains open from weeds protect ground cover plants. From the two lowest points of gravel beds, IIt took two narrow ditches, running them into the overall site drainage system. Through them there is excess water runoff, adversely affecting the plant (especially during winter). The entire composition is fragmentary,gradually, as long as I'm not completely satisfied. But drawing up of stone and gravel beds - not all. It must be remembered, and about landscaping. Competent landing hide minor oversights in the arrangement of the stones, make a bed "live" and really interesting. 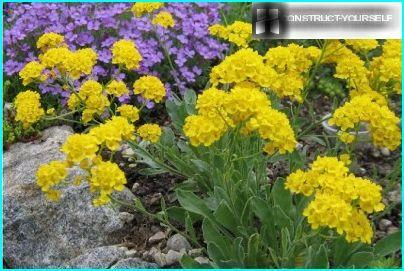 In its rockeries I grow plants, alpine,which require approximately the same conditions. For their beds, located in an open area, I chose a sun-hardy species, requiring loose, water impermeable soils. This ground and I was diluting ordinary soil with plenty of peat and disintegrating agents. Some plants I grew from seed, others- I bought in the form of shaped bushes or cuttings. Particular care for them is not required. I watered my plants up by the roots, without waiting for the excessive drying of the soil. I fed very rarely, once a season, using a soluble fertilizer. 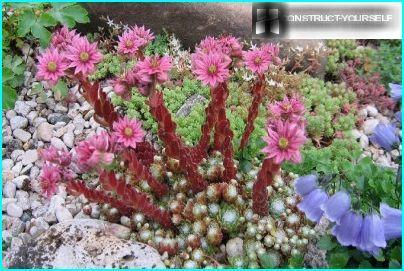 Alpines grow well in poor soils. I originally was a meager soil, so they do not grow much and stayed in a compact low cushion. The main thing that bloomed! That is if you do not bloom, then feeding required. And now about the range of plants. 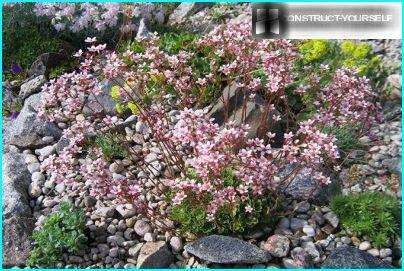 One of the most beloved - saxifrage Arends. It grows quickly, blooms magnificently, capable of self-seeding. Flowering is already the 2nd year of sowing, however courtines while still small. But in the third year, when her pillow grow up to 15 cm in diameter, obtained a real flower carpet. 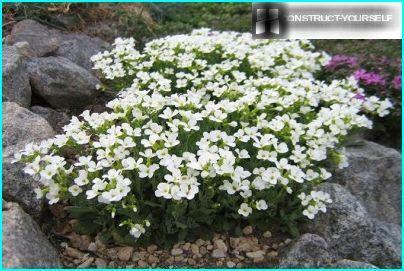 For saxifrage need to leave at least two feet of space. Only at first it grows slowly, and then confidently occupies large areas. He tends to a rapid widening and another residentmy stone beds - phlox styloid. Problems do not deliver, can tolerate sun and drought. Saxifrage Arends on this account more capricious as needs a good watering. And even phlox in spartan conditions on poor soils, very abundant and growing rapidly. 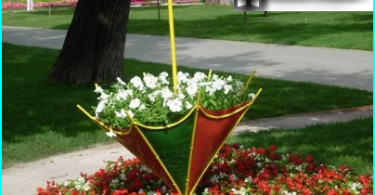 Therefore, by the way, and it is not suitable for small flower beds. Or bush have every year to cut to the required size, in principle, phlox such drastic pruning carries painlessly. Another drought flower - alyssumrock, the best feeling in the cracks between the stones. Repot it is undesirable, it will hurt for a long time. It should be immediately put to a permanent place. And then he will quickly show itself in all its glory, will grow and will close all bald spots flowerbeds. Unlike Alyssum rock, transplant wellAubrieta transfers. 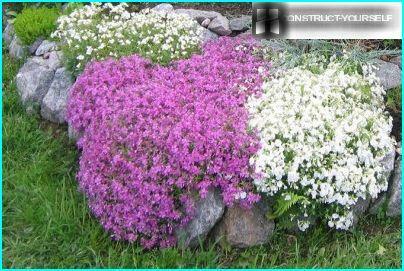 So she formed a beautiful compact bush and keep in shape, it is best to attach it between the stones. Apparently, Aubrieta loves tightness in the roots. Overcrowding and a small amount of soil transferredYoung. I've got three kinds - pautinistoe, roofing and opryskovoe. They form low, thick mats of green and tidy. And bloom unusually! They can be planted both on the ground and between the stones on the stone walls. It is non-aggressive, good-natured with other species, plant. I also really love stonecrops (sedum). 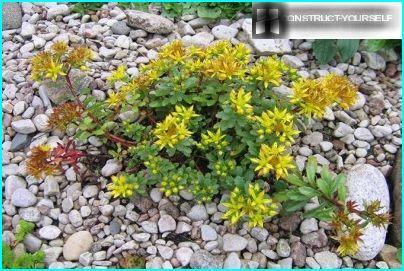 In general, I believe that a small rocky garden can be planted among molodilami and stonecrop. Stonecrop, in contrast, from the young, the aggressors. They grow at a breakneck pace, close them all the free space. Their shape must be constantly adjusted to contain. In my rockeries live stonecrops: crassifolia, rotundifolia, topolelistny, floriferous. Previously, all the ground cover in my flower bedblooms arabis Caucasus. Oh, no problem I do not have with him. Winters good spring quickly forms a carpet of white flowers. When it fades, about caring for them it is possible to forget - a true Spartan. Among the stones naturally look rockeriessmall alpine - giant bells and Carpathian. They almost did not grow, they remain neat clumps. Just behave Dianthus alpinus. The maximum that they can take in the flowerbed is 20-30 cm. In addition to all designated in the rocky garden Igrow Androsace, gentian, chickweed, Levisa, Aquilegia, oxalis, variegated periwinkle. The collection is quite extensive, so I had to come up with a strategy that helps me to create a sustained color composition and avoid chaos. 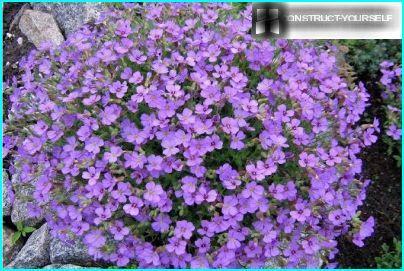 I do the following: planted in different parts of the flower beds among plant species. It turns out that the color spots, through some distance are repeated in common with each other. 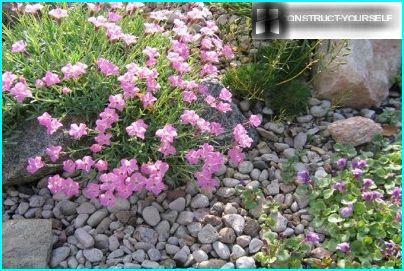 It brings harmony in the design of my rockeries. This will finish the story. While working on my Rocard will still continue. Constantly there are new ideas that I want to bring to life. I still continue to do, and I was very happy!